Andrew Moore leaned against a corner table in his Harthaven gallery, surrounded by his own work on one of the first warm days of the season. Behind him hung a nearly life-sized oil portrait of his daughter, Hannah, a parasol perched lightly on one shoulder. “I’ve maybe done one or two commissions, but generally, I paint things that are integrated in my life or ignite my imagination,” Moore said. A quick glance at the walls around Moore’s gallery is, then, an intimate revelation. There is Hannah, and there is the ocean. There are seals. Birds. The Gay Head Cliffs. A whaleboat, mid-construction, parked in a waterfront shop. In short, there is life; specifically, a life lived outdoors on the Island of Martha’s Vineyard, in the company of family and friends. “We’re very outdoorsy,” Moore said. There was a mountain of gear stacked around a lean-to in the driveway: boats, boat parts, skim boards, a trailer. A basketball hoop presided over the main parking area, and from an overhang outside his front door, a Boston Bruins flag defiantly waved. It was not the quiet, austere habitat you might expect of one of the Island’s most esteemed nature painters. It appeared to be first and foremost a family home, which may be why, as of this summer, Moore will be rejoining the gallery circuit, after more than twenty-five years of representing himself from his own backyard. Which isn’t to say the work-from-home model hasn’t suited Moore well. 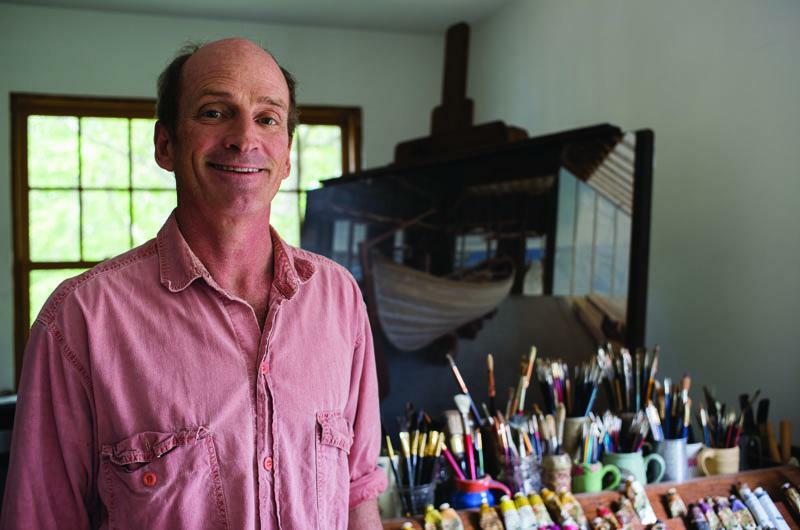 After eight years of showing his work in galleries on the Island, on Nantucket, and in Boston, he opened his own gallery in 1990 for mostly practical reasons. In the beginning, the gallery, a two-room structure with exposed beams and vaulted ceilings, was open for just a few months in the summer, and was used as a studio during the rest of the year. But Moore found he needed more of a physical separation between his work in progress and the finished paintings on the walls. He moved his studio into a room in his home, and kept the gallery open year round. In many ways, going back to traditional galleries will make this distinction even clearer. Starting with a show this month, Moore will be represented by the Granary Gallery in West Tisbury, and will once again use the home gallery for painting. This, to Moore, is an appealing prospect. But it is the sales component he is most looking forward to handing over to somebody else. The paintings-as-children metaphor extends to process, as well. When Moore is at work, his paintings are never far from his mind. As a child himself, Moore was exposed to the visual arts by his father, an architect, as well as more distant relatives. His great-great grandfather, Nelson Augustus Moore, was a Hudson River School painter, and he grew up visiting homes where the elder Moore’s paintings lined the walls. But far more present in Moore’s daily life was the influence of his mother, an art teacher, who often involved her children in projects around the house. Moore and his brother, Alley, were born in St. Croix, where, after finishing architecture school, their father relocated to start his own firm. “It was like the wild frontier,” Moore said of those years in the Virgin Islands, in the early 1960s. Although he remembers little of the experience, the call to adventure and an appreciation for design were instilled in him early on. Throughout high school, Moore explored various artistic media, while also excelling at science, math, and English. Following in his father’s footsteps, he enrolled in architecture school. This comprehensive, nuts-and-bolts approach is one that Moore followed as he transitioned from architecture student to professional painter. It was a gradual shift, and one that took place here on the island, where Moore has spent almost every summer of his life. Harthaven has been home to Moore and his ancestors dating back to the turn of the century. Chris Morse, owner of the Granary Gallery and a supporter of Moore’s work since the early years, is looking forward to the chance to reintroduce his friend to the Island in August. Perhaps this, then, is the beginning of a new chapter for Andrew Moore, one in which his work is available to a broader audience. Back in his home gallery, I imagined the space changed into the productive chaos of a working studio, and asked Moore if he thought being represented elsewhere might have any impact on his work or process.